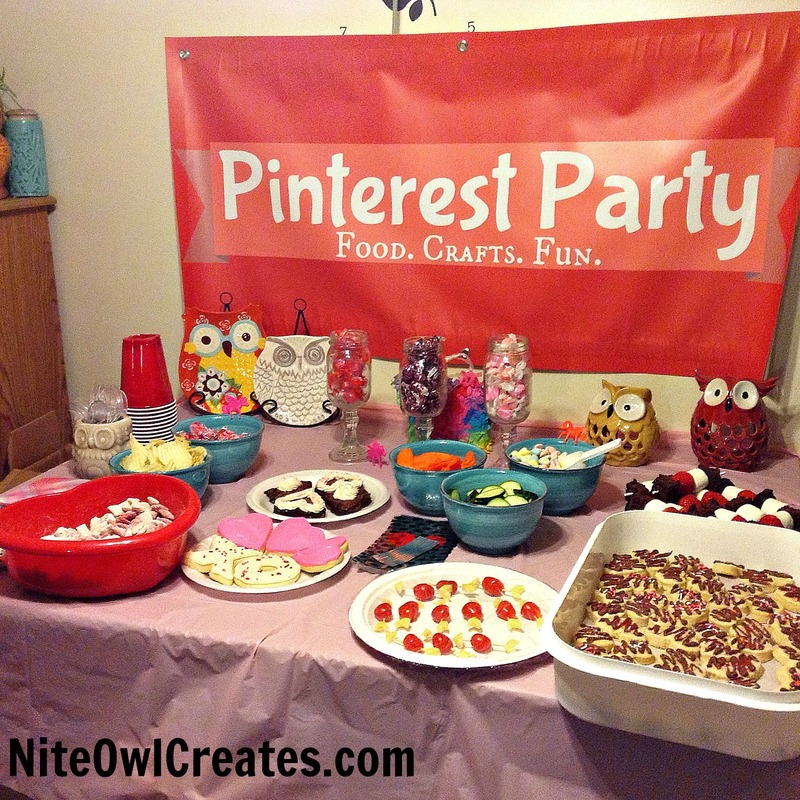 Nite Owl Creates: Top 10 Pinterest Party Planning Tips! I've been hosting Pinterest parties here in Utah for the past 3 years and have learned some things along the way to make things go a bit smoother. 1. Don't try to do it all yourself. I love to be the one who decorates, makes a bunch of food and provides all the crafts but it gets overwhelming and stressful to do it all so I've had to learn to step back, let things go, and delegate. It helps to have a friend who is willing to help you out. In the past I have had a friend who can do it, currently my sister helps me a lot. It's extremely helpful to have a person who can help you with the details. 2. Big crafts or small crafts? Depends on the size of your space and what your time frame is. I've had a mix...some short and easy crafts, 1-2 'bigger' crafts that take a bit longer to do and also crafts where the person brings the supplies and explains how to do it. We may or may not start the project at the party, then people can finish on their own at home. A majority, if not all of the crafts, get finished at the party. 3. Promote on Social Media - get the word out there! I do not mind if people who I do not know (yet) want to come. I'm all for making new friends! I post my invite on Facebook, Twitter and Instagram. I created a Utah Pinterest Parties Facebook group to ask questions and brainstorm with other pinners. Have someone do a live stream via Periscope! 4. Take lots of pictures! Before, during and after. You need to blog or post about it on social media afterwards. AmIRight?! 5. Using the Eventbrite website helped me better than just using a Facebook event invite for people to RSVP. Apparently many people do not pay attention to their event invites on Facebook unfortunately. Eventbrite was good because you can limit the amount of 'tickets' and have a wait list too. Using this site makes it easy to keep track of everyone coming. 6. Digital and hard copy invites. Digital invites are easy to distribute but printing out a bunch of invites to mail as a postcard, hand out at work or school or to the neighbors, also is good. 7. Send out lots of reminders. Especially if it is on Facebook. I personal message everyone who is coming or email them. I also try to touch base with guests a couple days before the event so if they need to cancel and have forgotten to tell me, I can inform someone on the wait list that they are in and they have a bit of time to come up with a treat or craft. 8. Treats vs. Crafts. I used to say, "Bring a treat and a craft to share. The craft can be one for everyone to do or just one that you have made that you want to show us." Maybe this is overwhelming for people to come up with both? I've also had a party where we had a ton of sweets and nothing savory so it was sugar overload. Now I say, " Bring a treat OR a craft to share" and stress that they do not have to bring a sweet, sugary treat. I also make sure I provide at least 1-2 'filler foods' like veggies or fruit, to balance out all the sweetness. 9. Utilize Pinterest to make a special board for those coming to the party. Pin ideas of food and crafts you want to do or plan on doing. If people have supplies for the craft projects, this is a good place to find out about it. I've also created a Utah Pinterest Parties Facebook group for posting ideas and announcements. 10. Just don't stress! Things are going to go the way they are going to go. Even with excellent planning and communication, things are going to happen that you don't want to. Just go with the flow and everyone will have a great time! I've never had a bad Pinterest party. Thanks for these 10 Pinterest Party Planning Tips. I am so glad to read this article. Well, I need to host kitty party but this time I want to book some indoor event space San Francisco instead of hosting the party in my backyard. My budget is quite limited so please suggest some affordable venues!